St. Luke's Cemetery is located on the south end of Hastings with the entrance on Minnesota Highway 316 across from the Hastings Armory. The western edge of the cemetery is on U.S. Highway 61, south of the Hastings Chrysler dealership. St. Luke’s is one of the oldest cemeteries in the area and is the final resting place for many of Hastings’ earliest settlers, indigenous residents, and many generations of Episcopalians. Church membership and Episcopal affiliation are not required to purchase burial plots, although active members do receive a discounted purchase price. The cemetery is cared for by local volunteers, and St. Luke’s Episcopal Church manages the perpetual fund and upkeep. 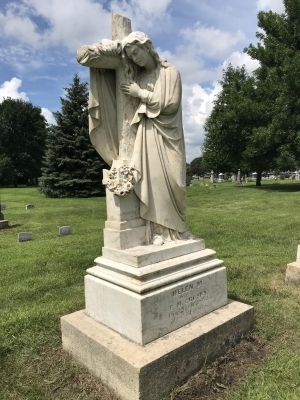 Our practice is to name a few people each week during our Sunday worship services so that each year, every person buried in St. Luke's cemetery is specifically remembered in prayer. Each plot may hold either one full burial, or two urns. Please contact the Parish Office with a minimum 48 hours notice prior to burial.